benny profane wrote: i'm not into the fixed starting points. in AoM it makes sense, but on this map it would feel like a gimmick. I love the idea for the map, I would certainly want to play on it. I agree with your own later idea to increase the number of fertile territories, allowing for an opponent to build up a base of operations before charging forward. Because of the decay, not allowing people to have a decent starting amount of territory just wouldn't be fair and would leave too much up to luck. Like I promised, here is a small example of the graphics of my next update. ---that is taken from what will become the large version. small will be shrunk a bit. ---The Fertile land will have a bunch of houses and villages and manmade stuff, along with some water and plants and nature effects. the desert will be mostly empty. The Oases will be about the same as the fertile land, except there won't be any manmade structures. just nature. ---thats the bottom right corner of the map. ---I haven't drawn in most of the borders yet. thanks for the image update, looks sweet. whitestazn88 wrote: thanks for the image update, looks sweet. He mentioned it was jsut a graphical sample and that me was still worknig on the complete image . . .
gameplays all in the desert. The Fertile land doesn't matter very much, its just the starting place for your race to the Grand Oasis. 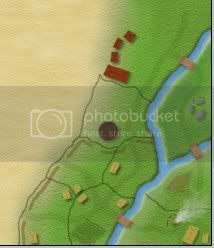 I finished drawing in the borders for the fertile area on the right side of the map. It is about equal in size to the fertile area on the image in my first post, but instead of the 10 countries there in the first draft, there are now 21. The countries will be packed much tighter, but it will still work well and look good (see my preview on page 3. the size of the countries in that image is about the same as the rest of the map.) The benefit of small countries is that once I begin developing the desert, i will be able to put a ton of countries in there and really make it the scale I am imagining it to be. It wouldn't suprise me if there ends up being around 80 countries within the desert. Deserts are big and mostly empty. that is the feel I am going for. Lots of space to travel and move around, and lots of oases to help build up your bonuses. The graphics are looking great, but i dont know if it is a good idea to have som many territories because there has been a lot of demand for small maps, and i know it is our map and you have a vision of what it should be like, but i think you should consider none of the less. But the graphica are looking awesome. militant wrote: The graphics are looking great, but i dont know if it is a good idea to have som many territories because there has been a lot of demand for small maps, and i know it is our map and you have a vision of what it should be like, but i think you should consider none of the less. But the graphica are looking awesome. Just because there is a demand for small maps doesnt mean the foundry have to provide . . .
ok guys, heres a bit more of the image. Its my new signature banner. The area in the picture is the entire right fertile land (but it is rotated 90 degrees so it can fit). I will be adding a few more details in, but thats basically it. If you turn your head to the side and try to ignore the huge Title i put on the picture, you can see what it will look like. There still aren't any borders drawn in the desert yet, and one country (top left of the image) got completely cut off because i couldn't fit it all into the sig. If you are wondering what the big dirty brown-ish circle in the middle is, just think of it as some kind of animal pen, with sheep or cows or something inside it. I labeled it V1.5 cause its not finished yet. V2 will be up in a few days. Excuse all the extra writing I painted on. I didn't want any "why is ____ not colored?". Its not finished, except for the parts that the blue is pointing at. All of the right fertile land and the Key. and comment on the rest of the finished stuff, if you want to. Nice looking map, wca. It's got that troy feel to it (and since troy is one of the maps I most wish has actually been quenched, that's a good thing). I do have one issue at present: the font used in the title bar is weird, the 'h's are really oddly shaped and kinda look like 'a's. If you could look for an alternative or two, that would be awesome. I'm looking forward to seeing the rest of the map and the country breakdown. Incandenza wrote: Nice looking map, wca. It's got that troy feel to it (and since troy is one of the maps I most wish has actually been quenched, that's a good thing). he stole exactly what i was gonna say. the legend/key is very hard to read. i had to look at it almost 3 times before i could fully realize what i was seeing. what is the deal with territory bonuses on this map, as i know a lot of newer ones are featuring things like, no territ bonus, or +1 per 2, or whatever it may be. maybe a little clarification? The purple text on the key are all the bonuses there are. +3 for each oasis held. 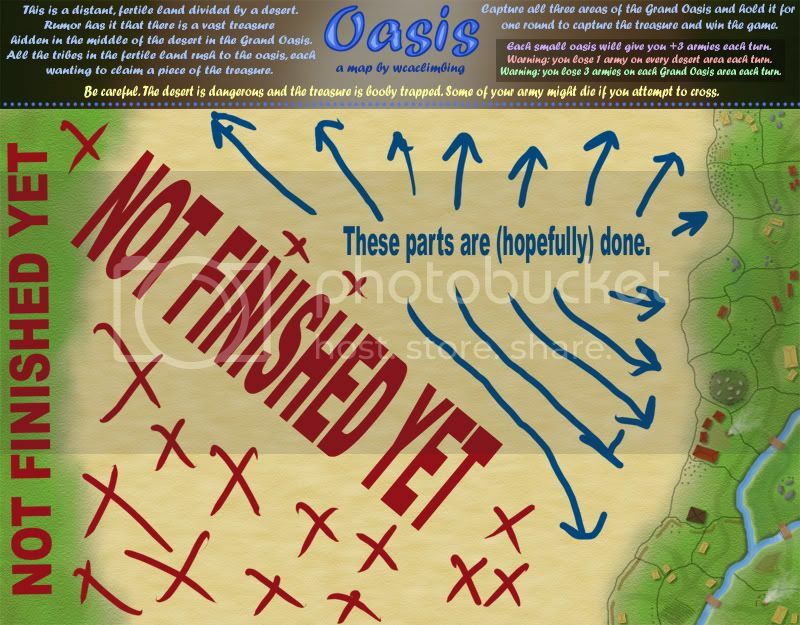 There will be a lot of oases on the map, so there will be plenty of chances to get a lot of armies. I changed the text on the key, and its a bit easier to read. You will see it on the next update. the image so far looks GREAT. i agree that a better font is needed. am i correct in assuming there won't be any bonuses for the green borderlands? I like the villages on the edges. I really like this map. However, varying the number of territories and bonuses of the oases would make this map more interesting. Also, I'm concerned that some players may have to deal with a signficantly inferior territory drop. I think the small oases should have autodeploy. It seems to me that that reflects the whole idea of an oasis better.